"David Byrne is an installation artist, author, blogger, recording executive, photographer, film director and PowerPoint enthusiast. He’s even been known to dabble in music. But in certain New York neighborhoods he may be most visible as a bicycle rider, a lanky figure pedaling around the Lower East Side, or from Bay Ridge out to Coney Island in Brooklyn or up to the Bronx Museum of the Arts. 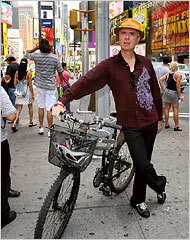 David Byrne makes me proud to be an American.